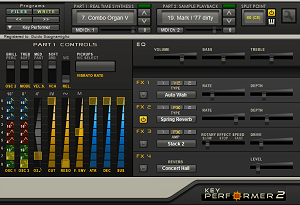 On March 2009 GSi launched Key Performer, an hybrid sample player and real time synthesis instrument offering a complete palette of sounds largely used by keyboard players. Well, I have been working hard on a version 2 that would offer new sounds, new features and bi-timbrality, but eventually I abandoned the project in mid-2012 because I gave priority to other projects. Now I was thinking of offering this plugin as a free update to all existing KP1 users, in a beta version, Windows only (32 bit and 64 bit VST) and without documentation. What do you think? "Like" our Facebook official page and leave us your comments!